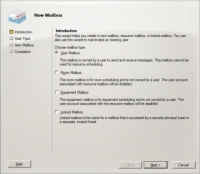 In previous versions of Exchange, you created network user mailboxes using Active Directory Users and Computers (ADUC). 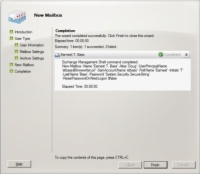 With Exchange 2010, however, Microsoft has removed the Exchange management features of ADUC. 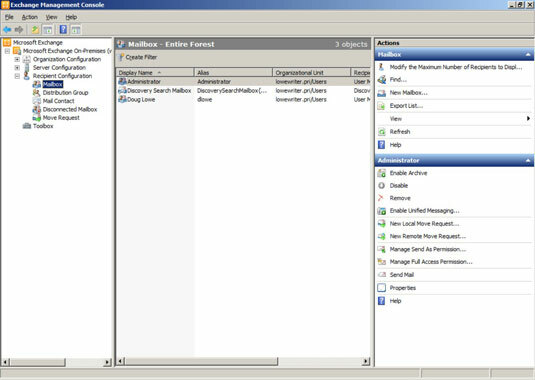 So instead, you create and manage user mailboxes using Exchange Management Console, which you can find in Server Manager on the Tools menu. 1From Server Manager, choose Tools→Microsoft Exchange Server 2010→Exchange Management Console. This fires up the Exchange Management Console. 2In the Navigation pane (left side of the window), navigate to Microsoft Exchange→Microsoft Exchange On-Premises→Recipient Configuration. If you have more than one Exchange server, pick the Microsoft Exchange On-Premises node for the server you want to add the user to. 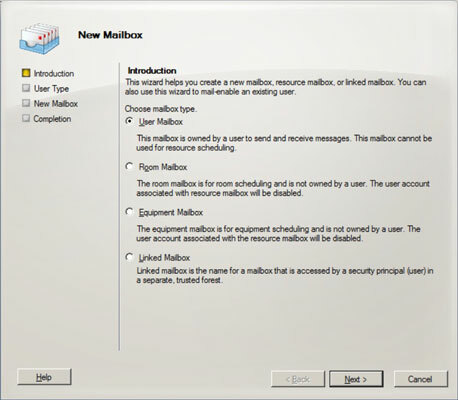 3Right-click the Mailbox node in the navigation pane and choose New Mailbox. This summons the New Mailbox Wizard. 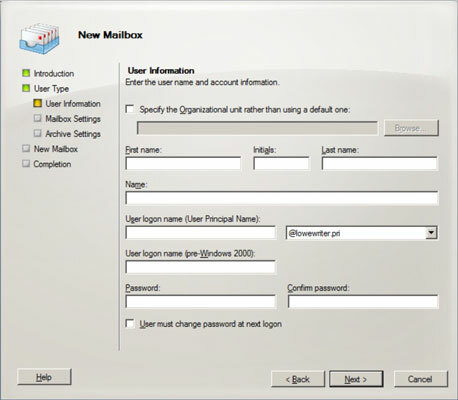 From here, the first page of the wizard, you choose among several different types of mailbox accounts you can create. 4Select the User Mailbox radio button and then click Next. This brings up the User Type page. Here, you indicate whether you want to create a new user account or add a mailbox for an existing AD user. 5Select the New User radio button and then click Next. The User Information page is displayed. 6Enter the user’s first name, middle initial, and last name. As you type the name, the New Mailbox Wizard automatically fills in the Name field. 7(Optional) Change the Name field if you want it to appear different from what was proposed. You may want to reverse the first and last names so the last name appears first, for example. 8Enter the user logon name and the password twice. This name must be unique within the domain and will be used to form the user’s e-mail address. You’re asked to type the password twice, so type it correctly. If you don’t type it identically in both boxes, you’re asked to correct your mistake. 9If the password is temporary, select the User Must Change Password at Next Logon check box. Click Next. This setting requires the user to change the temporary password the first time he logs on. 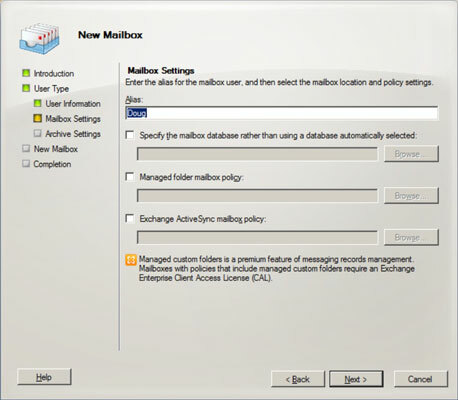 The Mailbox Settings page is displayed, where you can create an alias for the user’s account name and also set several Exchange options for the user’s mailbox. 10Enter an alias for the user and then click Next. The alias can be the same as the name that was used in the Name field on the previous page of the wizard, or you can type a different name if you want. 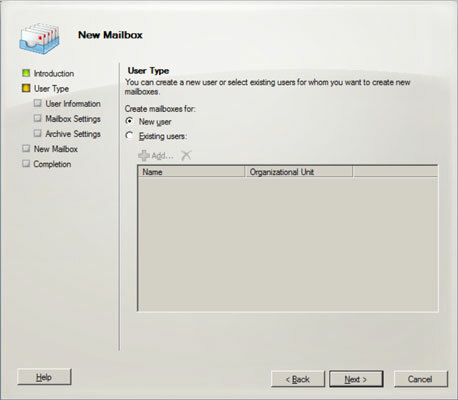 11If you want to create an archive mailbox for the user, select the Create an Archive Mailbox for This Account check box; otherwise, leave the option deselected. 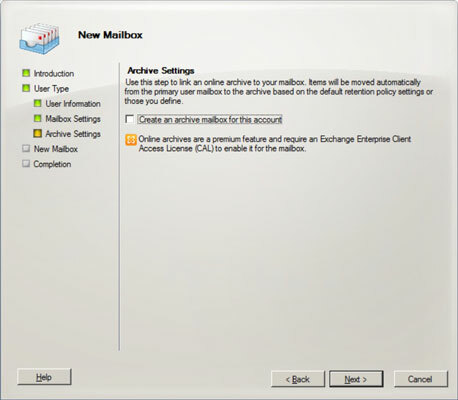 Archive mailboxes are available only with the Enterprise Edition of Exchange Server 2010, so don’t even think about this option unless you’ve shelled out the money for Enterprise Edition. You’re taken to the final page of the New Mailbox Wizard. 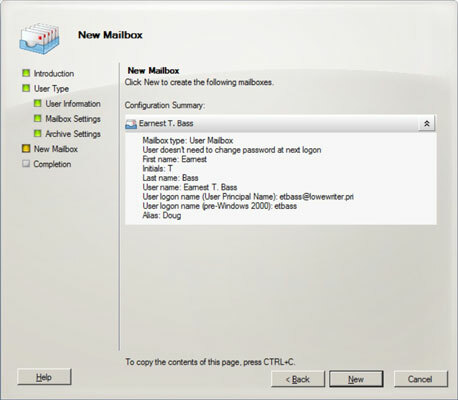 13Verify that the information is correct and then click New to create the mailbox. If the account information is not correct, click the Back button and correct the error. 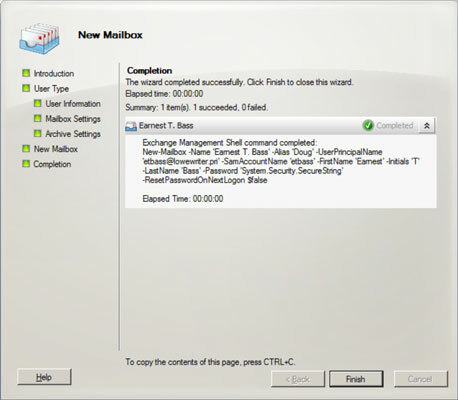 When you click Next, Exchange Management Console displays various and sundry messages and progress bars as it creates the user account and its mailbox. 14Pat yourself on the back; then click Finish.